The human immune system is an amazing, complex, intricate biological framework of structures and processes that is exquisitely designed to protect the body from a wide variety of pathological agents. It is composed of countless cellular and subcellular mechanisms that gives it an intelligence and flexibility that is nothing short of miraculous. B cells and T cells, and Natural Killer cells (that’s really what they’re called!) and immunoglobulins all coordinated and synchronized and astoundingly effective, in most cases the immune system is all that stands between us and potential disaster caused by bacterial, viral and environmental invasion. Without an immune system you would be dead in hours. That’s why, in the world of toxic pharmaceutical drugs, among the worst, are drugs that suppress the immune system. The medical community loves these drugs as many of the health challenges patients face today involve excessive immune activity, misdirected immune action or inflammation which can be regarded as the obvious manifestations of the immune system. Prednisone, and its derivatives, has long been a mainstay of treatment for immune based disease states. Many drugs for asthma and rheumatoid arthritis are likewise immune suppressants. 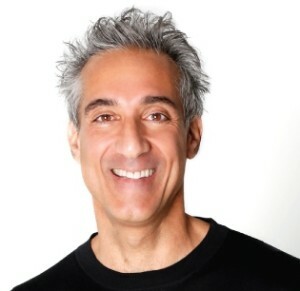 And just last week, a study appeared in the journal Annals of the Rheumatic Diseases that suggested that the immunosuppressant anti-cancer drug Gleevec (imatinib) showed promise for treating the autoimmune disease of the connective tissue called scleroderma. By making a few simple changes and by applying some good old fashioned mind power, we can begin immediately to change our health for the better. And it doesn’t matter whether our health concern is weight loss, acne, high blood pressure or even cancer. Because of the body’s remarkable ability to heal itself, and make no mistake about, the body does indeed heal itself. For example, did you know that according to scientists at Texas Tech University and Cornell University, allergy sufferers are far less likely to contract cancer than everyone else? That’s because allergies activate the body’s healing and defense mechanisms which are collectively known as the immune system, and the activated immune system not only responds to allergies but also helps fight cancers too. When you get a cut, thousands and thousands of germs and viruses can get into your body, if you get splinter, now you’ve got a big invader in your body. No problem! The immune system kicks in, destroys the germs and viruses, and walls off the splinter and seals the wound. If it happens to miss something which it does occasionally, no problem. The immune system kicks in with a second phase of activity and you may see some inflammation and pus which is nothing more than evidence of a functioning immune system. Every day we swallow and inhale many thousands of germs and viruses and toxins and pollutants and these too are destroyed by the immune system. In the unlikely event a germ or virus gets through, we catch a cold or the flu or some kind of infection and once again this is nothing more than evidence that the immune system is doing its job in a kind of phase two fashion. Most of the time it will eventually it takes care of the infection and we’ll get over our cold or flu or whatever.You see folks this defense mechanism we call the immune system is charged with healing the body from many of the assaults that we turn to doctors and drugs to treat. The immune system is responsible for fighting colds flues, infections, sinusitis, sore throats, bacteria, viruses even cancers. And my friends that is without needing doctors appointments, emergency room visits, insurance companies or anti-bionics. 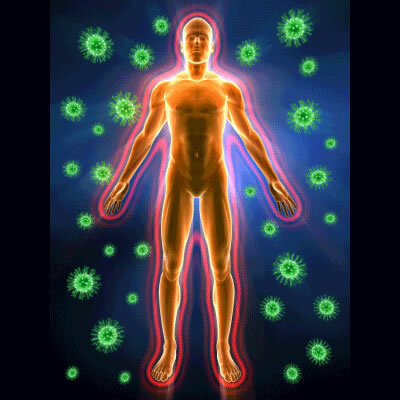 The immune system simply needs to be cultivated with good nutritional and health practices. If you’re one of those folks that seems to get sick every time there’s a “bug’ going around or if you’re paranoid about touching door handles or that neighbor or employee in the next cubicle with sneezy, runny nose or hacking cough, the bright side is you no longer have to be concerned. If it’s taking you two or three rounds of different more potent antibiotic to get rid of a cold that used to be gone after one round or if you’re even thinking about getting the flu vaccine, the bright side is you’re no longer going to need a shot OR antibiotics. If you’re kids are getting chronic ear infections, sore throats or stomach flu, the bright side is that can all be put behind you. Sure there is a time and a place for anti biotic medicine and heroic intervention and as a pharmacist I am well versed in the importance of emergency medicine or the miracles provided by anti biotic treatment. Antibiotics have saved countless millions of lives in last 80 years and if you have a nasty pneumonia or staph infection there’s no better way to treat it than with a couple weeks of penicillin or Cipro. The debate is not about the importance of antibiotics, it’s about our dependence on them. You see, the trick to wellness is to support the immune system so our bodies don’t reach the point where we need the anti-biotics. You see what I’m saying? Our immune system, when it’s strong and vital should be able to take care of most common bacteria and viruses.. so the trick here is to commit ourselves to lifestyle choices that support our bodies abilities to withstand these assaults. To support our immune systems with our choices and habits so that they are robust and vigorous and perform their divinely mandated role of defending our cells and tissues and organs. So they can defend us. But in order to make appropriate choices we first have to understand we we’re dealing with here. So lets talk a little bit about the immune system.The immune system simple put is the defense department of the body charged with protecting us from invaders from and from within. The immune system is everywhere in the body , it’s not localized to one part of the body or one organ system, but rather it is composed of billions of specialized cells that float around throughout the body especially in the skin, nostrils, lungs, digestive tract and the linings of our internal organs. Some cells float around as patrolling soldiers others stand guard in the linings of our blood vessels and organs. Mucous plays a critical role in the functioning of the immune system, by trapping and blocking the effects of dust, allergens, bacteria, viruses and other invaders. The skin is one of the most important components of the immune system and in a way you could even refer to the skin itself as an immune organ. 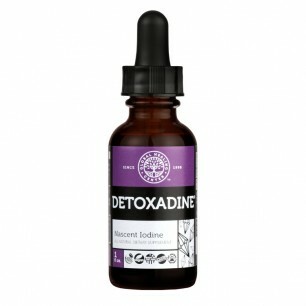 Many so-called skin diseases like psoriasis, eczema, rashes and even many instances of acne are really nothing more than the activation of the skins immune response. And by immune response, I simply mean a defense response, sort of like those sirens that go off when a city is being attacked by enemy bombs. One of the main routes or highways for immune cells to travel through is a vast network of vessels and nodes, totaling hundreds of miles. Collectively called the lymphatic system, most people are hardly aware of this critical transport system for the body’s defense department. The lymphatic circulation is similar to the blood circulation except instead of blood it carries a white substance called lymph. Lymph fluid bathe all the cells with nutrients and oxygen and sugars and then it is re-circulated throughout the lymph vessel system. The Lymphatic system also acts as a drainage system and cellular debris, bacteria, viruses and other invaders are all carried and drained away by lymph fluid. One problem with lymph circulation is unlike blood circulation which is pumped throughout the body by the action of the heart, the lymph has no pump. It depends on muscle motion for its flow. This is one reason why exercise is so important. If you’re overweight or sedentary you can end up with lymphatic congestion where the lymph fluid isn’t flowing like it should. This can lead to cells not getting the nutrients that they need or, even worse, lymphatic congestion can cause bacteria and viruses and other toxins to pool up. The combination of cells not being nourished and toxins building up can cause metabolic disorders, infections and accelerated aging. Get yourself a rebounder, a mini trampoline you can buy at an exercise equipment store or on-line. 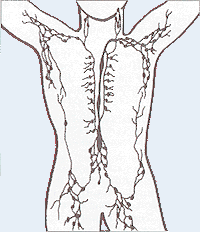 Its one of the best ways to make sure lymphatic fluid is moving around as it should. The up dand down jumping motion is ideal for moving lymph fluid around. Get some exercise, go to the gym. A brisk walk can help. You can even have lymphatic massage done, where a health professional, physically manipulates the lymphatic vessels to break up blockages. Drinking enough fluids can also help to dilute lymph, thereby improving circulation. As lymph fluid flow through the body it stops at many thousands of different, collecting points, called nodes, lymph nodes which are small bean shaped complexes that act to filter the lymph and kill the bad guys, the viruses and germs and poisons. Lymph nodes also trap cancers and produce white blood cells the main solders of the immune sytem. The white blood cells, technically called lymphocytes are divided into two main classes T and B cells are the true superstars of the bodies defense system. They travel around the blood, mostly in a resting state until they’re activated by the enemy at which point they pump up chemicals like anti-bodies (love that word!) that prepare the enemy for destruction. Can you begin to see how cool the human body is? These T and B cells are also produced in the bone marrow. B cells stay in the bone but T cells are passed on to the thymus a gland near the top of the lungs and behind the breastbone. Both T cells and b cells travel through the lymphatic system and the lymph nodes. The main lymph nodes are in the armpits, the groin, under the jaw, behind the ears and both sides of the neck where your doctor will check for swelling if you’ve got a cold or some kind of infection. If you have some kind of infection or abscesses or even cancer you may end up with swollen or painful lymph nodes. Pressing on a lymph node and feeling swelling or pain or warmth or tenderness means something’s up, because usually you can’t tell where a lymph node is. A major concentration of lymphatic tissue is in the spleen, which makes houses white blood cells among other things. The spleen also acts as a filter for foreign cells and other invaders. If you have you’re spleen removed you’re going to get sick more often unless you take extra care of your immune system. A major component of the lymphatic system is the digestive tract. So called GALT, gut associated lymphatic tissue is located throughout the digestive system and in fact makes the intestine the largest mass of lymphatic tissue in the body. The tonsils and adenoids and the appendix as well as the intestines all contain lymphatic tissue that is associated with the digestive system. The lymphatic system is so important for the immune system that it can pretty much be considered your immune circulatory sytem. Keeping your kidneys and bowels operating properly is critical for lymphatic health. And anything you can do to improve the elimination of waste from the body is going to play an important role in maintaining a healthy lymphatic system and immune system in general. One of the best things you can do to make sure that your lymph and immune system is operating optimally is get yourself on whey protein. First of all whey protein can have beneficial effects on the good bacteria that live in the colon. Good bacteria help process toxins and germs and they improve bowel function and stool formation. These can all reduce the amount of poisons in the lymph and may help improve lymphatic congestion. Whey protein also contains anti bodys that can support our own anti bodys again removing some of the work load on our immune system. Whey protein is a wonderful source of glutathione which is a powerful chemical that can detoxify poisons and support their elimination from the body. Whey protein is also a great source other wonderful molecules that kill germs and fight diseases. Lactoferrin, Lactoglobulins, Lactoperoxidases, Lysozymes, these are all tremendously important substances for supporting immune health and they are found in large amounts in whey protein. Interestingly, as important as these substances are, some people may have reactions to them, and these may account for some of the allergies some people have to whey protein. But, if you don’t have a problem with it, you are absolutely crazy if you’re not supplementing with stuff on a regular basis. In fact, whey protein shouldn’t be a supplement to your diet , it should actually be a component of your diet. It should probably be your main source of protein, as long as it doesn’t result in an allergic or digestive reaction. It’s cheap, it’s filling, it’s a great source of protein, and it’s incredibly important for supporting immune and digestive health.